A San Francisco treat --- in the form of addictive Chinese food --- on the Lower East Side. 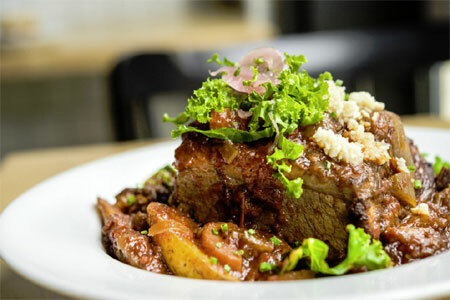 : Don’t judge a restaurant by its façade. Just inside the door of this Lower East Side eatery you’ll see backlit photos of Chinese dishes, giving the place the feel of a cheap Chinese take-out joint. Walk to the back room, though, and you’ll get the joke. 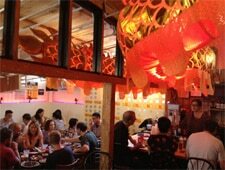 Welcome to Mission Chinese Food, an import from San Francisco that is now a hit on both coasts. Chef Danny Bowien doesn’t create Chinese dishes by the book, but who cares when the food is so satisfying. The kung pao pastrami, for example --- an obvious homage to the neighborhood --- intermingles tender pastrami with vegetables and tastes like the product of a collision between Big Apple institutions Katz’s Deli and Grand Sichuan. Other menu hits include thrice-cooked bacon and the soupy pumpkin-laced pepper leaves. There are a couple of wines available by the glass and two beers on tap, as well as a cocktail and spirits menu.